There and their sound the same but they do very different jobs in English grammar. Whilst there has several functions, their only has one – it indicates possession to one or more people or a group. So, remember that their belongs to them and does nothing else. There can act as a noun, a pronoun or an adverb. It is never used to indicate possession. We need to go to station. How long will it take to get to the station? We need to go to the station. How long will it take to get there? I like the seaside. I will go to the seaside on Tuesday. There were flowers in the vase. Will there be time to go to the zoo? Shall we stay here for lunch or go over there? There is a house. It stands there across the road. Shall we go over there and have a look at it? The house belongs to Tom and Tina. It is their new house. I prefer our house to theirs. de. 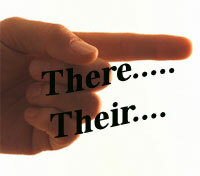 "Difference Between There and Their." DifferenceBetween.net. June 8, 2016 < http://www.differencebetween.net/language/difference-between-there-and-their/ >.